VanLife Crisis: Redoing the van conversion, getting back to my roots. My first conversion was a bed across the back style, with a kitchen-esque counter running down one side, and the other having a desk. 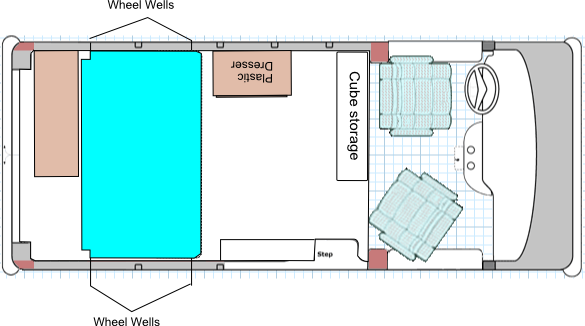 Given my height, I never liked that bed layout, and have since tried other layouts with more leg room, with the bed going along one side or the other. But in the end, the wasted space is just too much for me. I want to fit everything I had in the van previously, PLUS what I need to do wood carving. And do it in such a way that I still have a healthy bit of floor space after to use for sitting or totes for sell-able items for flea marketing etc. Oh, and I want to be able to remove any part of the conversion, in case I need to for more cargo space. Sounds crazy, but I am doing it, without spending any more money to boot. In fact I am already mostly there. I am going back to the bed across the width of the van style layout. I was temporarily using the foldable 'rock n roll' bed thing i made to do this, as I could shrink it down accordion style to fit between the wheel wells. Today I took it out, as it didn't allow under bed storage. Then built a new one that was taller and open underneath. Here is the support frame, very simple and easy to make. I could have made it wide enough to touch the wheel well, but I wanted to make it real easy to maneuver in and out, plus that space can be used to store long thin things. Previously I had left room between the bed and the rear doors to put tire change tools, and have access to the under bed storage. My bed was built permanently into the van, on top of the wheel wells. This time the bed's support frame will be built to sit between the wheel wells, with the top platform over hanging them. My tests with the folding bed showed that is plenty stable enough. I still used the hinged platform top for now, which i will try to replace later with a lighter piece of plywood, without hinges. The mattress is still the same memory foam mattress I got 3 years ago, though it might need a pad under it now. So I sacrificed more room at the back, sliding the bed forward until it aligned with the front of the wheel wells, leaving me all the space from wells to rear to play with, and and add the shelving unit you see here. 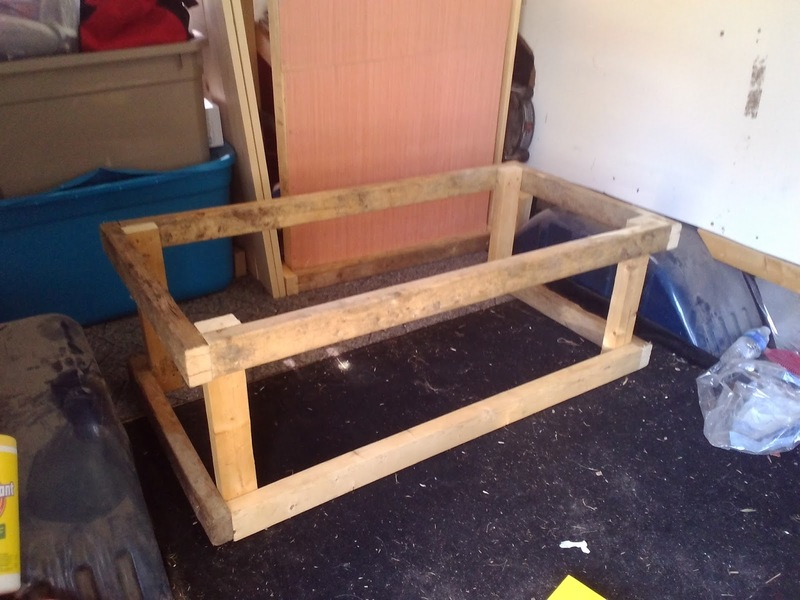 It's basically made the same way as the bed, just with longer upright 'legs' and smaller frame at top and bottom. This will be my new tool storage area. I sized the bottom to fit the height of a propane tank, then 2 smaller shelves above. Vertical space baby! I can fit my power tools, tool box, paint supplies and auto equipment in there. 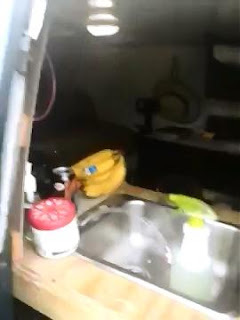 Here is a nice little trick if you want to build a shelf in a vehicle, to keep things from falling off. Angle the shelves downward (back of shelf sits lower than front). This will keep your stuff from falling out (unless your doing some crazy rock crawling I guess). I might even use the router to cut grooves and then make slide in dividers, so I can slot tools individually in their own spot. Open the back doors, and just grab what I need. Even just the shelves the way they are, are a tremendous help so far. There is still room to either side of the shelf unit, where I have my lumber stock for now. On the passenger side of the rear, is room for large stack-able totes, one of which holds my completed signs. These can be accessed from the bed or the back passenger side door. I don't want to put too much there however. I want the option to open it and push my way out or lock/unlock it in case of an emergency. Earlier I mentioned sacrificing floor space by pushing the bed forward, but this is space reclaimed from having a bed that is fully accessible for storage. Most of my day to day life stuff will probably go under there, except for food and clean clothes. Behind the drivers seat, I have my kitchen galley that I previously made. It fits my batteries, fridge, water supply, sink, and food. That leaves about 3-4 feet of space between it and my bed. 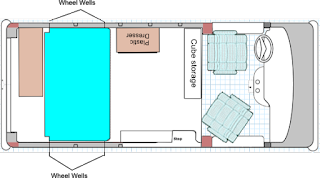 I plan to rig a desk that folds up along the driver side wall where the galley used to reside, but I might put a plastic drawer there for my clothes. Or I could do both depending on if I have enough room. The wood for the shelf and the bed were made from wood that I got from a torn down building. The guy was happy to haul less away himself. I had a 3, 2"x3" boards left over from previous projects I have done on the van. I still have lumber from the other bed as well for future projects too. I'm curious to see just how comfortable this setup works in practice. I once again have to sleep in the fetal position or diagonal, and when sitting on the bed I can't sit straight up without hitting my knoggin on the ceiling. But I got used to it before, I think I can re-adjust again. But as I've learned, you never really know how viable a conversion layout is until you've had time living in it.